Open rear door and remove single screw retaining end flange of molding to rear body pillar. Open rear compartment lid, and from inside rear compartment along inner side of quarter panel remove the belt molding retaining nuts, cup washers, and rubber washers. 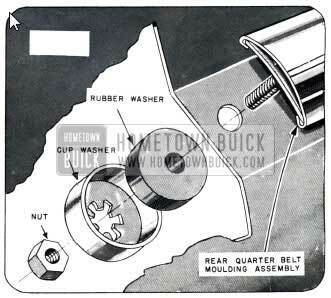 From outside body remove the rear quarter belt molding assembly (see Figure No. 52). To install, reverse this operation. Apply “3M Autobody Sealer” to molding screw hole on rear body pillar. Remove screws along lower window opening holding reveal molding retainers and belt molding in position, and remove retainers. Open rear compartment lid and remove only forward molding retaining nut, cup washer, and rubber washer to remove the front section of belt molding. (See Figure No. 52.) This front section laps over the rear section. 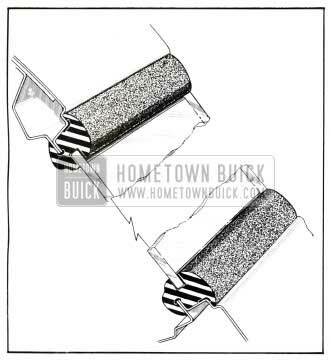 To remove the rear section, remove the remainder of the retaining nuts and washers from inside the rear compartment along the quarter panel area and remove molding. To install, reverse this procedure. Prior to installation, apply “3M Autobody Sealer” to door outer panel at belt molding retaining screw holes. Also apply sealer to inner surface of belt molding at lower curled lip. 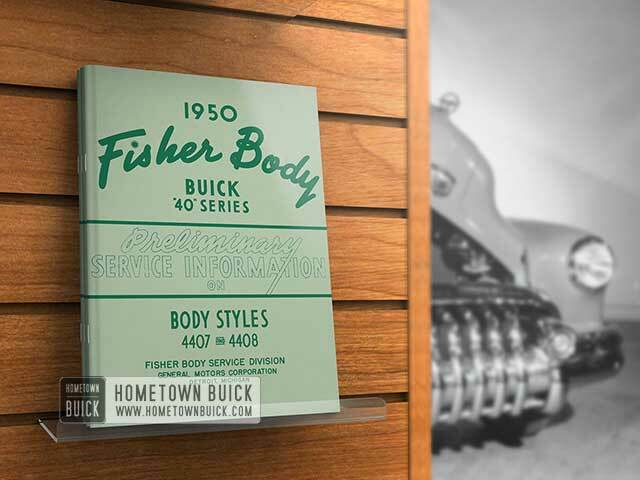 Remove the 1950 Buick rear quarter window glass (see Rear Quarter Window Glass – 2 Door Dynamic Coupe). Remove the four (4) lower reveal molding retaining screws along the lower quarter window opening. Lift up lower reveal molding to free from retainers and remove. To install, reverse this procedure. Apply “3M Autobody Sealer” to inner surface of molding along curled lip prior to installing. Lower quarter window glass and remove upper garnish molding. Remove the single glass run channel retaining screw at the rear of the quarter window opening. Pry the upper section of the glass run channel toward the inside of the body to release the channel retaining clips from the header. Remove the entire upper section of glass run channel by pulling up and out. The lower end of this channel will pull free from its retaining spring clip. Remove the exposed reveal molding escutcheon retaining screw and escutcheon from inside body at rear of quarter window opening. Remove the exposed upper reveal molding retaining screws above quarter window opening from inside body. Remove upper reveal molding. To install, reverse this procedure. Apply “3M Autobody Sealer” along inner surface of molding just under upper curled lip. When installing upper section of glass run channel, make sure lower rear end of channel is first threaded into its spring retaining clip. 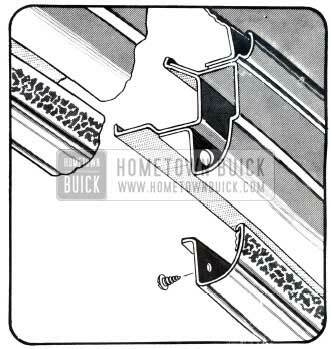 Remove back window garnish molding by removing attaching screws. 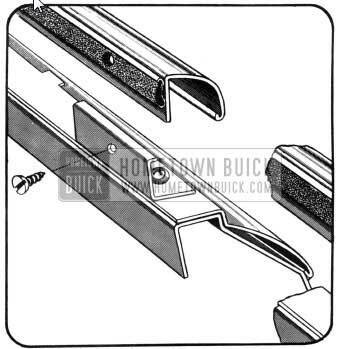 With a flat bladed tool, loosen the rubber channel from sealer under inside lip of channel around interior of back window opening. Apply moderate hand pressure against the glass from inside the body and carefully force the glass and its channel at one side to release from the pinchweld. On the outside of the body remove the glass and rubber channel assembly from the opening. Note: The glass remains in the channel during removal. Remove the glass from the channel after first loosening glass from sealer at outer lip of channel. Prepare back window opening for installation of glass and rubber channel assembly. Remove old cement, dirt , etc., from opening. Apply a 3/16″ to 1/ 4″ diameter bead of “3M Weatherstrip Cement” on front edge of rabbet around entire back window opening. See diagram Figure No. 55. Install rubber channel to edges of glass. Insert a strong cord into pinch weld cavity of rubber glass channel. Allow a loop of cord to extend out of the channel at one side, while the two ends of the cord extend out of the channel cavity at the opposite side. Be sure the two cords forming the loop overlap each other within the pinchweld cavity. Using a mild soap solution and cloth , lubricate rubber channel inside lip. Install glass and rubber channel into window opening with cord accessible from inside body. With either a helper or masking tape holding the back window assembly firmly to the opening, use the cord from inside body to pull the inner lip of rubber channel over the pinchweld. After assembly is in position, apply a 1/8″ diameter bead of “3M Weatherstrip Cement” around opening under inner lip of rubber channel as near edge of pinchweld as possible. Also apply cement between glass and outer wall of glass channel on the outside of window. Reinstall back’ window garnish molding.